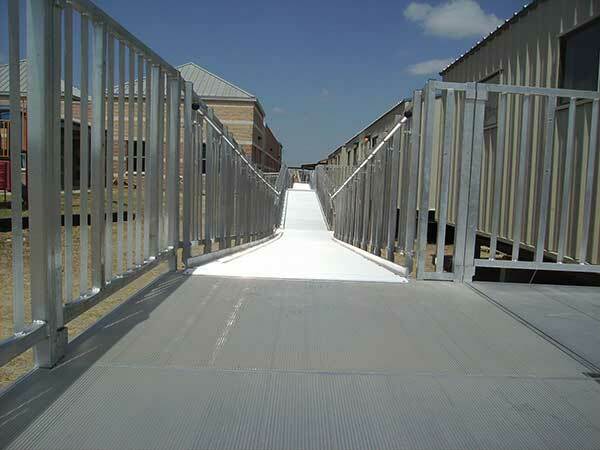 All our rectangle platforms are designed so that the ADA wheelchair ramp can attach to any of the four sides. These adjustable wheelchair ramps allow you to go right, left or straight on the same platform. You can also attach two or more ADA wheelchair platforms (same size sides) together to make large decks or platforms. All the ADA wheelchair ramp and platform support legs are independently adjustable for easier installation (meeting ADA Ramp Slope) on uneven ground. 6 Foot ADA Ramps Sections 100 lbs. per Square Foot 48" 55"
(ADA Standards Size) 100 lbs. per Square Foot 60" x 60" 64" x 64"
(CA ADA Standards Size) 100 lbs. per Square Foot 72" x 72" 76" x 76"
5' x 7' Platform 100 lbs. per Square Foot 60" x 84" 64" x 88"
Child (optional) Handrail Height 22"
Handrail Diameter Requirements 1 1/2"